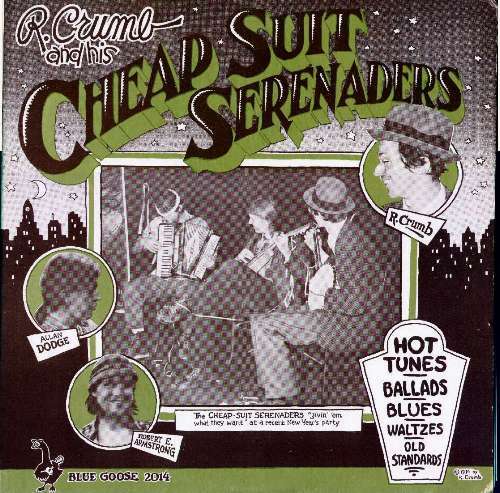 "R. Crumb and his Cheap Suit Serenaders"
"R. Crumb and his Cheap Suit Serenaders" is the first album by the CSS. 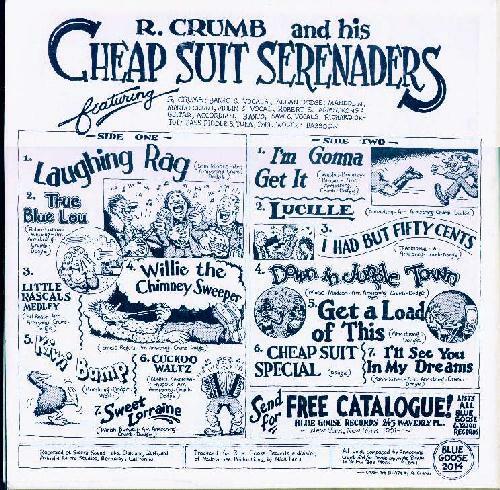 It features R. Crumb, Allan Dodge, and Robert E. Armstrong. The three remained the core of the CSS over the next two albums, CSS#2 and CSS#3 despite many changes in personnel. This album does not appear to be available on CD. FLASH - Now available from a Japanese company - I'm told that the informational contact on the pages will respond in English. "Airmail Recordings" (Japan) - follow link for "artists"
The record contains up-tempo string band music, mostly songs from the early part of the 20th century. It's fun, light hearted and has surprisingly little sarcasm considering the tone of the nominal leader's better known art form! The cover has a background of a typical "Crumb" scene of an old city, with the title drawn against a starry sky. A sepia-toned photo of the band is in the foreground, labeled "The Cheap Suit Serenaders givin' 'em what they want at a recent New Year's party." In the picture, Crumb is playing a four-string banjo, Dodge a mandolin, and Armstrong a "Universal" accordion (the brand name of the accordion is barely visible). Insets photos show each member's face, and a hand drawn tombstone shaped label in the lower right says "Hot Tunes - Ballads - Blues - Waltzes - Old Standards." The back cover has the title again and a list of the musicians and their instruments. The songs are listed with small Crumb illustrations for most of them. At the bottom is some information on the recording.